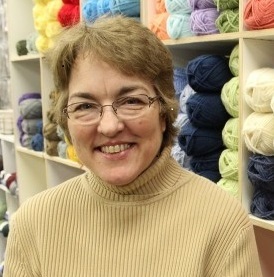 Yarn Asylum opened in October, 2013. Our mission is to provide yarn and notions to knitters and crocheters in the greater Clarksville, TN area. Our goal is to offer a wide variety of these supplies to accommodate the budgets and skill levels of the majority of yarn crafters. In addition to products, we want to offer a safe and welcoming place for you to come and enjoy the company of others who share the same fiber addictions. Join us for Group Therapy on Wednesday mornings from 10:00am to 12:00 pm. This is a free and social time to come and work on your projects, inspire and be inspired! It is a great way to meet new friends and gather with old ones. Please note that anytime we are open, the table is available for you to sit and knit or crochet. If you haven’t already, sign up for our Newsletter to stay informed about what is happening at Yarn Asylum. I try to send it out monthly, but I must admit that sometimes life interferes with my best intentions. Here, you will find a listing of our Classes. If you see a class you are interested in attending, check out the Events section and see when it is scheduled. If it is not on the schedule, let us know and we will get a class scheduled as soon as we can! The blog – My Life as the Director of an Asylum – will be where you can find frequent Yarn Asylum updates and my rants and raves.